John Key did you lie to the Serious Fraud Office? 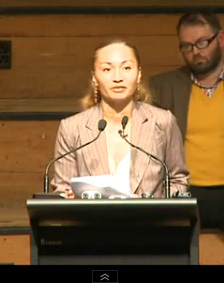 Kia ora ka tou, congratulations on being here tonight, I’m really glad to be here too. I’m really the last speaker – so what a lot of things that needed to be said have been said already and I’m going to give a bit more context about the GCSB and what the issues are about – I’m going to give you some context – because some things that needed to be said have been said already – I’m going to give some context about this GCSB and what the bigger, wider, issues. So setting aside for a moment the issue of spying on New Zealanders – I want to say what the GCSB does most of the time – because it mostly spies on other countries. It mostly spies on other countries, and a large part of its work is not spying for New Zealand, it’s spying for the United States, and all that work that it does, is never ever seen by New Zealanders, and it is in effect like an outpost of the NSA in the South Pacific – even though they would never like people to say this. It is a very strange, and a very un New Zealand kind of New Zealand organisation, the most un-New Zealand organisation that we have in our Government sector [audience claps]. And I want to, I’ll give you some examples of this, because the main reason we should be worrying about the GCSB for other people, not ourselves actually. In the 1950’s and 60s it was in the deep of the Cold War and it was spying mainly on Russia. It spied on China in 1980s. It was helping the British spy on Argentina – helping the British spy on Egypt. It continued to spy on China. We spied on France; we spied on Vietnam and the Philippines, South Africa and many more countries, other countries, for the US during the 1980s. In the 2000s, we moved into this thing whole thing to spy on Spanish speaking countries of Latin America. Why? We’d already moved into spying on Iran; you can guess why – and after September 11– GCSB officers have been flying away on regular shifts to work out of US headquarters in Afghanistan, alongside their military trained colleagues, to spy on the ‘enemy’ – except it’s not an ‘enemy’ New Zealanders were told about – to help kill them with raids and bombs and drones, in Pakistan and Afghanistan. And if you think – what this means of course that if you think New Zealand’s interests and foreign policies and values are identical to that of the United States and Britain and then this seems like a good idea – but if our interests aren’t exactly the same – then years after we’ve stopped being a colony – acting like a colony which still does the work of these countries – is a very strange place for New Zealand to be [audience claps]. And it’s all totally secret, there is no public input at all. So it’s very important there is this controversy going on now, ‘cause this is a rare opportunity, for us to not just be thinking about the GCSB Bill but thinking about the GCSB [audience claps]. Now, the other thing I want to say is about, lots have been said; I want to say a little bit about spying on New Zealanders. I want to talk about how far and how wide it has gone – but also how far and how wide it hasn’t gone first. And I say this because there will be, when this Bill passes, whenever legislation is passed that is too wide and too poorly thought out and it’s too secret [to] what they’re doing and there is not enough controls and the wrong people are making the decisions – there will be people targeted like you been hearing about tonight who are the wrong people who don’t deserve to be victims – they’ll be casualties to this piece of legislation when it does through the way it does, and it looks like it will do. But also I’m in the position where I got; I get contacted by large numbers of people who worry that they are being spied on, because they hear about things like this. And one of the great, one of the sad things about having unnecessary spy laws and unnecessary powers is they don’t just create real harm they create much more wide spread fear. And so the thing I want to say tonight, even though it sounds a little bit counter the meeting, is that most people in this room are not going to be spied on by the GCSB and most people out there throughout society – and there will be [people who are] – but part of us trying to reduce the harm and the hurt of something like this, is not to spread unnecessary fear – because they attack peoples sense of self and their confidence and their ability to be involved in politics [audience claps]. Now like the other speakers here – I think this is obviously a really bad piece of law. It’s an unnecessary piece of law. It’s being justified, sometimes with absurdly weak excuses – and there is almost an invitation to future scandals which will come along when we discover what went wrong with it. But I’d like to also just before we run out of time put [it]in a larger context because what’s going with this GCSB Bill is just the tip of an iceberg of what is happening – it is not happening in isolation – what we’re really talking about is that we’ve moved into the digital age. We’ve moved into a time where people live much more of their lives online. They store their lives online. They communicate online. Compared to using a telephone a generation ago – people’s privacy and their selves are vastly more exposed than they were in the past – and at the same times as people have exposed themselves more digital technology has given previously unimaginable powers to intrude into that. And it doesn’t matter whether you swipe your card in the supermarket ‘cause you think you’re going to save some money and it registers what you brought and who you are every time you do that, or whether it’s the GCSB or things in between – there’s been a huge growth in the ability of people to have their live surveilled. On top of that, different kinds of mass surveillance tools have come out. The ‘War on Terror’ which allowed a vast expansion, resources, the GCSB doubled in size, it’s overseas allies more than did that, and just like the American intelligence agencies which moved from spying on the Russians to spying on Americans – surprise, surprise we discovered the same thing had happened here – that they moved those great big Cold War resources to use against domestic targets as well. So that’s the context in which we see what’s going on, and it’s all happened invisibly and secretly and the GCSB Bill we should realise is not the end of the world and the only issue on it, it’s like a jump, on a curve which has being going up and up over the last couple of decades – and that’s, so that’s, my main message tonight – whether or not they pass this Bill, which they probably will in the next few days, that can’t be the end of the fight, in fact bringing the GCSB into the light and having the attention on it has to be the beginning of ongoing action, and there is one other thing that we should feel inspired about at the moment and this is another tremendous part of the digital age and that’s the Wikileaks example [audience claps]. And that’s the example which is going to keep, this is the example, this is the idea that one of the ways that ordinary people can control centralisation and excesses and abuses of power is by leaking information, by fighting back in that way, and what Edward Snowden is doing at the moment is something that just doesn’t happen every year, it doesn’t even happen every decade – he is exactly the right person, at exactly the right time at that point in our history, who is illuminating something incredibly important and the energy which we have built up in New Zealand about the GCSB Bill combined with Edward Snowden living in his house hidden, in Moscow now, is the perfect opportunity for us to change things. So I would argue this is the time not to be despairing if the GCSB Bill goes through but be setting up new internet privacy organisations in New Zealand and to be working together and to be looking at that broadly with a picture and start to change it, and I feel optimistic about this because I believe, the basis of my life is, if ordinary people know about things then they will care about them and they will work to change them. If you don’t feel as optimistic as me, look around this room, please look around the room, and see how many people there are here with you and keep caring and keep working to change it. Look, ah, mine’s going to be a little bit different, don’t be offended folks, when I get into my korero. I noticed it at the last public meeting on the Bill that we held in Mt Albert, and I noticed it here again tonight that our audience is mainly middle class, mainly Pakeha, people with jobs, home, life security and the time to ponder the issues of the day – issues such as this [audience claps]. I don’t say that to be offensive, I simply say it to highlight the difference, and the disparity in the lives that we lead in this country [audience claps]. 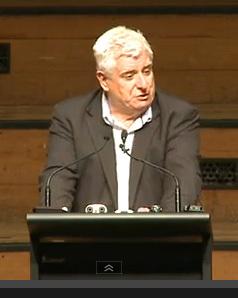 Because regardless of whether people are Maori, Pasifika, Pakeha or of any other ethnic origin – poor people, hungry people, people without jobs, people without security, beneficiaries, just don’t have the time or the inclination or the energy – to worry about things like global spy networks and the gathering of metadata [audience claps]. And chances are most of them don’t even know about or care about Bradley Manning or Edward Snowden or Julian Assange or Wikileaks or even Whaihopai – and it’s not because they don’t care about spying, far from it – beneficiaries’ care about spying alright, they experience it every day, they suffer from it, their families are affected, by their families destroyed by it, they are frustrated by it, and their spirits are broken by it, by the grinding, ruthlessness of it all. Sure it’s not the James Bond sort of stuff that we all hear about , nor is it the macho, gun slinging fiasco, like when the Keystone clowns broke into the Kim Dot Com mansion – but it is still spying. Beneficiaries in this country are already spied upon. Their life details checked, cross checked, amended, deleted, debated, destroyed – how do you say published starting with a ‘D’ – [audience laughs] – distributed [audience claps]. Without their knowledge, and without their consent – by a network of computers, by Work and Income, Housing New Zealand, the Accident Compensation [Commission] Corporation, Child Youth and Family, Inland Revenue, the Justice Department, the Department of Corrections, the Police, and no doubt a few other departments and agencies I’ve forgotten to list. And yet who marches for their rights? Who stands up for them? How many, how many Queen Counsels – kia ora Rodney [Harrison QC] – New Zealander’s of the Year, law professors, human rights advocates, political leaders, or even New Zealand residents of German extraction [audience laughs]. 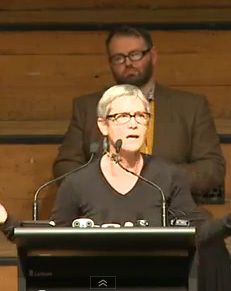 Will stand up for the rights of the poor, and the down trodden, right here in Aotearoa [audience claps]. Are we here tonight simply to express our indignation at the loss of our own precious freedoms? I will happily stand alongside all those around the country who oppose moves to expand Government’s capacities to spy on its own citizens. But let me gently remind those of us comfortable enough to be able to be upset by such moves – that those moves began sometime ago, and that many of you gathered here tonight may have harrumphed with righteous indignation, and possible even nodded in support, when those laws were passed to allow our own Government to intrude upon and to spy into the lives of our fellow citizens. This is something that affects us all. Just over thirty-two years ago I attended a HART meeting just after the Police had bludgeoned many of our friends at Molesworth Street in Wellington. 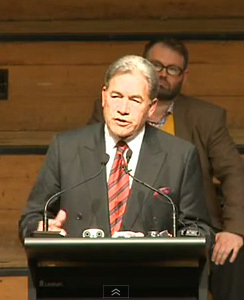 When I was asked to join with everyone else in condemning the actions of the Police, I said I’m sorry for those who have been hurt but in a way I was kind of glad that middle New Zealand was finally feeling what Maori and Pacific Island had been feeling for decades [audience claps]. And tonight as we gather to express our disappointment and our anger at the state and intruding upon our lives, please bare with me when I say again, that hopefully middle New Zealand finally stands up and gets what Maori and Pacific Island people have been fighting for decades [audience claps]. In 1981 we stood together united with by view, that the blow to freedom of anyone is a blow to freedom of us all. Now I can tell by the number of the grey beards out there tonight – there’s quite few of you who are here tonight. It’s the same thing – it is the same thing. Apartheid over there, racism over here -G[C]SB and the global spy network and its impacts on us here – right here in Aotearoa. As we stand here united in our opposition to the GSCB Bill and in our, our commitment to rolling back this vicious piece of legislation, I hope that unity lasts until we roll back every piece of legislation that criminalises people for daring to try to survive in a deeply unequal world. Tena koutou, tena koutou, tena koutou katoua. Kia ora, tena koutou katoa, and good evening. Thanks to John Minto and those people who have organised this evening and for you to have come out tonight, and for the chance to speak to you about a very critical issue for our country. The issue we face is not whether we have security agencies or not – New Zealanders are after all realists, they know we live in an imperfect, often evil world. We need to have security agencies such as the GCSB. We need leadership on these issues of national security that we can trust – and to ensure we get that trust, we first need laws that we can trust [audience claps]. The real issues are how much new power are we giving the GCSB? Second how do we have an effective oversight of that agency, and third how do we avoid relying on one person, the Prime Minister, to safe guard our civil liberties? New Zealand First’s proposal on the Bill addresses all these questions. When the legislation came up, we took the Prime Minister at his word, as did my colleagues behind me – he said he wanted broad Parliamentary support for this legislation, and we believed that broad Parliamentary support is critical for such legislation because the security and safety of our citizens should be every politicians number one concern [audience claps]. And we have all offered a constructive way forward, for a robust, workable oversight of this law and the GCSB – but sadly the Prime Minister has acted in bad faith. There was only the pretence of building a wider agreement, but the moment he got the one vote he needed, from you know who [audience laughs]. 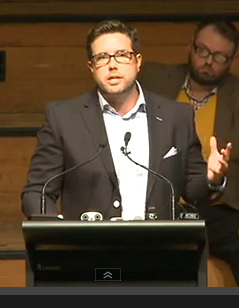 Well you weren’t trusting John Banks we’re you [audience laughs]? Once he got the one vote, it was a done deal; any thought of seeking broader Parliamentary support vanished. And the tragedy is that despite the fact that a lot of these people went through Auckland Law School, not one National MP has dissented from the current GCSB Bill [audience heckles]. Now George Orwell had a phrase for that – “group think” [audience claps]. They’re telling the country if ‘you’re not with us, you’re against us’, ‘if you’ve got something to hide’ – [audience laughs]. That’s what they’re saying, the law’s justified. Doesn’t matter what you’re hiding, that it might be private, it’s still their concern. – now what an odious view the Government and its cling-on’s take of their fellow New Zealanders. First, the GCSB was an international spy agency; it will now become also a domestic spy agency. Second, the GCSB’s intelligence powers and functions were constrained; they will now be seriously widened. Third this organisation could previously not legally spy on New Zealanders, New Zealand organisations, or New Zealand businesses – now it can. Fourth, under existing law all manner of domestic information data is off limits for the GCSB – now it is not. And fifth, today a warrants’ checking agency has to explain the particular, or general threat to national security posed by an individual – now if accessing metadata, no such explanation is required. And six, no such explanation is required, if private communicating parties should have contemplated that their communication could be accessed by a third party. This sounds complex but, in fact, it reads like an excuse for hacking, let alone troll security agencies. What’s worryingly clear though ladies and gentlemen, is that Mr Key does not understand the law that he’s talking about [audience claps]. It was clear as daylight on that Campbell show, that he didn’t understand the law – and it will be clear to all those who have being on the committee looking at this matter that this man has no experience on this issue and is not concerned about its complexities and it’s dangers [audience claps]. He does not understand the law, and let me say this, if he did, and he believed what he was saying was true, why does he plan to make a Parliamentary statement in the Bill’s, in the Bill’s Third Reading, as guidance to the courts. Here was I thinking our judges had New Zealand case law as a precedent, Commonwealth and other precedents to guide them – now they have John Key’s guidance by way of a speech [audience laughs]. This is thoroughly bad law. It’s an admission by the Prime Minister that his law is clear and present danger to the freedoms and values of the people of this country. I want to close by saying; we will not support legislation that makes our Prime Minister all powerful [audience claps]. 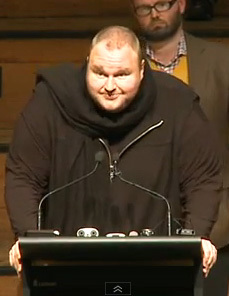 Even if you thought John Key was as trust worthy, benign, and as innocent as Mother Theresa [audience laughs]. You would be mad to put so much unbridled power into the hands of one person, who has such a flimsy understanding of hard fought civil liberties [audience claps]. Finally, finally – when Mr Key said he had no knowledge of Kim Dot Com, or the raid, he was not telling the truth [audience claps]. His constant denials are false, and his supporters need to know, that soon he will be found out, and when that day happens, they will bitterly regret their trust in him. We ask the Prime Minister and his colleagues, even at this eleventh hour, to think again. 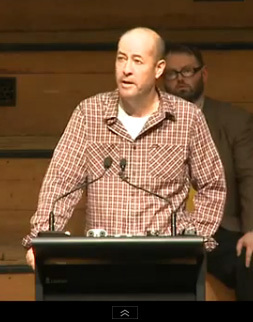 Tena koutou katoa, it is fantastic to be here and may I acknowledge the organisers of this fantastic public meeting – what a great job you’ve done [audience claps]. This just isn’t about the GCSB Bill – though it is about the GSCB Bill – but it’s about so much more than that. It’s about the quality the relationship between a people and their Government. A people should not live in fear of their Government – a Government should be a servant of their people [audience claps]. We can make Government once again a servant of the people, together we will, and can make history. This is about the quality of our relationships with each other. How can we have proper human relationships with each other, if we have no private space where, in which we can communicate honestly, our opinions to each other without living in fear that those communications could be intercepted and used against us? How can we have proper human relationships [audience claps]? And this is about the quality of our democracy. Democracy is not just a popularity contest once every three years – Vladimir Putin can run one of them [audience laughs]. Democracy is about some fundamental rights like – the freedom of expression – the right to live free from state surveillance. 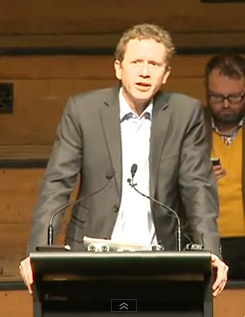 Democracy is more than just voting once every three years Mr Key [audience claps]. And this debate, indeed this struggle which we are engaged in, is also about the quality of our relationship with the rest of the world. We don’t wish to be the second rate follow up, the second deputy sheriff, to the great United States of America [audience claps]. We want to have an independent foreign policy; we want to be a respected country in the world. We want to be a nation state known for its belief’s and its values [audience claps]. Instead across Europe, and the, across civilised world the United States is now being viewed with suspicion, and fear, and as member of the Five Eyes Network , we are now being seen in as part of that – and I don’t think we want to be seen as part of the global surveillance state [audience claps]. There reason we can have this meeting here tonight is because those who came before us fought for our democratic rights and our democratic freedoms – that is the only reason that we can have this meeting here tonight. And I think we need to acknowledge the people who have come before us [audience claps]. I seems now very apposite that John Minto was one of the organisers. But these democratic rights and freedoms that we have, that go back centuries – these democratic rights and freedoms were not giving as a charity by those who had power, to the people – they were taken. They were taken from people just like you. They were taken by people whose stood up for something and had their voice heard. So tonight what I would ask of you is that – we don’t know what is going to happen this week in the house, maybe y/know we’ll get lucky and find in amongst those [forty-nine] fifty –nine National Party members of Parliament, one of them will have a conscience, y/never know [audience laughs]. But whatever happens tonight, remember, the democratic rights and freedoms you have right now are a result of the people that came before and before us and fought for those democratic rights and freedoms. And our job, our job here tonight and over the next year, is to play our part in the chain of history and make sure we restore our basic democratic rights and freedoms and over turn this bloody law. Kia ora katou, it is so great to be here with you all tonight, turning out for an issue that strikes at the very heart of our freedoms and rights as New Zealanders. Let me start by saying, in case you missed it, that we in Labour oppose this Bill utterly [audience claps]. We are fighting, and have fought it all the way, to stop this Bill with you, with the other political parties, because this Bill will make bad law. It fails to get the basic balance right between the need to keep our country safe and our fundamental rights to privacy – and those rights are something I am absolutely committed to protecting as the leader of a future Government [audience claps]. Because some, some people might say this issue doesn’t matter to New Zealanders – in fact there was a poll the other, about 4 months ago that said thirty-two percent of New Zealanders said that they had full trust, sorry ‘only’ thirty-two percent of New Zealanders said they had full trust in our intelligence agencies, we have to revise that in light of John Campbell’s latest poll. And that’s why a Labour led Government will commission a full, independent inquiry across our entire intelligence network and of the basis of that replace the current law [audience claps]. We need to restore that trust that people have, and this review should not be just about the GCSB, it has to be about the SIS, and the Police, and the Defence Forces, and how they actually work together, because we do know before the GCSB issue came up that there was new legislation being proposed for the SIS as well – and the idea was to bring the SIS and GCSB even closer together – that’s been shelved because of what’s going on now [audience claps]. So we will work with the other political parties including those here, and it’s been a privilege to work with them over the last few months, to set the terms of reference for that inquiry – and we will talk to you, to make sure that we have the right changes made for this law in the future. This Government isn’t listening; it’s ramming this Bill through, not because of any urgent changes are actually needed – but because it wants to get this issue off the political agenda. Y/know I actually asked John Key if he had any evidence that New Zealand would be at risk if his legislation wasn’t rushed through, would there be a greater threat somehow without this Bill? And he couldn’t come up with a case for why these changes are so urgent. – it’s a just a matter of trust really isn’t it. Well if that’s the case? Why not put it in the legislation [audience claps]? So tomorrow in the House, Labour will propose an amendment to put that promise, of not looking into the contents of New Zealander’s emails into law. And we’ll see if Mr Key stands by his word and support’s it – because the whole trust thing hasn’t worked out that well so far [audience laughs]. We’ve had to drag the truth out on every issue, on each of the debacles that have continued to go down the tracks. From Dot Com – actually I want to just acknowledge Kim Dot Com and say we wouldn’t be here if it wasn’t for him – looking at our legislation [audience claps]. From Dot Com, from appointing your mate as the Head of the GCSB, to illegal spying, to snooping around in journalists emails – it took weeks, and weeks until we got to the bottom, in each of those cases, to what was going on. Now as New Zealanders we deserve much better than that. They need to know there is proper oversight of our intelligence agencies, and right know too much power lies in one person’s hands. The Prime Minister appoints the Head of the GCSB, currently his mate, Prime Minister heads the Committee overseeing the agency, sets the agenda of that Committee, and has the casting vote – so during the inquiry we had, I asked because he was the, the committee overseeing the agency sets the agenda of that committee, and has the casting vote. So during the inquiry we had I asked, because he was, the, the proposal was that the GCSB was going to be helping out the SIS, the Police, the Defence Forces – perhaps we could hear from the Police, and the SIS about exactly what they were going to be doing, why the need the GCSB. That was refused, it was voted down by the committee. So you can see what sort of role that committee has. But the Prime Minister also appoints the Commissioner of Warrants who issues the spying warrants, appoints the agency’s watchdog, the Inspector General – there’s nobody else providing those checks and balances and that is utterly unacceptable [audience claps]. New Zealanders are looking for leadership on this issue. We went to the Government to see if we could find some way forward but it wasn’t interested. Instead I was told Peter Dunne was willing to give his vote, and get them across the line [audience heckles]. A ‘willing buyer’ and a ‘willing seller’ as Dunne so eloquently put it. So the Government has got the numbers to slip it across the line – on a profoundly important issue and that’s simply not good enough. If we truly want to restore public confidence in our intelligence agencies we have to move beyond the fog of scandal and actually work together. We could do much better than this Bill. Some of the best safe guards in the world could be put in our legislation – we could actually have some of the world leading legislation here – we have that opportunity, we have that chance. But we’ve squandered it. It requires a commitment to do what is in the best interest of New Zealanders rather than what’s politically expedient [audience claps]. Labour will provide that commitment and that’s the promise I bring to you tonight. Kia ora everyone my name is Marama Davidson and I am speaking to you tonight as a social justice advocate who also happens to be a Maori woman and a mother [audience claps]. 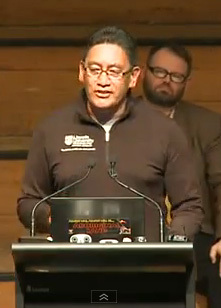 State spying is nothing new for Maori or indigenous peoples around the world [audience claps]. The way that state spying powers have been used to trample on innocent people around the world has always being an injustice. This Bill, this threat to our privacy and democratic freedoms did not just start today. Other groups often targeted by state surveillance include environmental groups, human rights and social justice activists, peace activists, those fighting for independence from oppressive rule, and certainly indigenous rights groups [audience claps]. So I am thankful tonight for an opportunity to remind us of this historical injustice in relation to further state powers being granted in that same direction. I urge all New Zealanders, to consider that this abuse has never been good and it won’t be good for any of us now as the tentacles of power extend their reach over more of us. Some of the laws that we already have – never mind any new ones being proposed – are an offense to the rule of law in every way that they have being enacted when it comes to targeting groups. The Tohunga Suppression Act 1907 and the Suppression of Rebellion Act 1863 were made arbitrarily and to smooth Colonial oppression over Maori. In 2007 the Terrorism Suppression Amendment Act was post ‘Operation 8’, as the wonderful Jane [Kelsey] has alluded to, where the Police acted unlawfully, unjustifiably and unreasonably during those armed raids. They impacted on innocent children and whanau in Urewera. The GCSB Bills is just more of the same rubbish rushed legislation and should not be seen in isolation of the ongoing smearing of particular groups, communities and organisations. 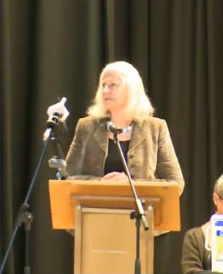 Continuing – continuing with this Colonial history in the GCSB debate, Dr Leonie Peihama reminds us of the shameful invasion of Parihaka in 1881 [audience claps]. Her ancestors were branded rebels; land stolen to advance Colonial invasion and people unlawfully imprisoned for seeking justice. Te Whiti O Rongomai, Tohu Kakahi and the families of the Parihaka community faced whatever the equivalent monitoring and surveillance of the day was then, despite their peaceful actions and intentions. It is too easy to dismiss the historical blight as just that but unjustified targeting, monitoring and surveillance has continued to today. This very hall you are all sitting in right now is on the land of Ngati Whatua and the Mana Whenua iwi of Tamaki Makaurau [audience claps]. Bastion Point Takaparawhau itself is a glaring point of legislative harassment. We recall people in our living memory also, such as Maori leaders Syd and Hana Jackson who suffered ongoing harassment from Government. Today there are two many of our social justice fighters who have been subject to unfair and discriminatory state surveillance – as a country we have not stood next to them and demanded the return of their democratic freedoms – but I am mightily glad we are all here now [audience claps]. I mentioned indigenous rights groups, as the global market economy seeks to gain power, [T]TPPA (Trans Pacific Partnership Agreement), over the planet’s resources the uprising of indigenous peoples around the world becomes so important. As the custodians of land and water, indigenous people, alongside environmental groups, and just concerned citizens are seeking an end to the unsustainable exploitation of our living systems and to have their sovereignty affirmed. In doing this, we are affording protection to the planet for all peoples [audience claps]. But this stand has again cost many our democratic freedoms when it comes to spying and Government harassment. For example Filipino young people are facing an education system that is geared towards multi-national corporations and denies their indigenous heritage and identities – when indigenous youth voiced these concerns they faced various harassment, including surveillance. The Canadian Government continues to monitor the activities of aboriginal people who resist incursions on their indigenous rights and territories. The ‘Idle No More’ movement was borne last year in response to omnibus legislation which effectively removes indigenous peoples’ rights over their own lands. Canada’s Government and its spy agency closely monitored the activities of that movement – what is even funnier – is the spy agency tried to claim it was doing so, not over fear of protest getting out of hand but to protect the activists from potential violence. Question mark? Hundreds of years of history simply laughs at that assertion. But it is no laughing matter. Whether or not you even agree with the stances of such groups who have been targeted, they all have a democratic right to express themselves and associate them without fear of unreasonable search and seizure. So how can New Zealand remain independent and truly be a leading Pacific force? I like Seeby’s [Woodhouse] list where we have being number ones. This morning I released a blog about my children being part of street protests – given that my own parents met as protesting teenagers on the 1970s steps of Parliament this is a natural progression for me and mine. My youngest four year old child often accompanies me on such campaigns – there’s one Maori woman here tonight – I’m going to take this. I wonder if we are giving John Key a good enough head start to get her search warrant written up because you can bet your life I am committed to teaching her to stand up, not just for her rights, but for the rights of others [audience claps]. The real threat to our national security is not someone like her. We could become actual leaders of the world if we were to resolve the issue of rights instead of jumping to spy on everyone. We could be true protectors of the security of our nation if we stopped with the assault on our democratic freedoms for a start. If we were to show the planet we are assisting the global change that is needed for stronger communities, and supporting families to be the best contributors they can be, this would hold us in good stead. There are legacies for our children waiting to be manifested by us but our leadership is bland and not courageous at all. It is the current leadership which is the biggest threat to our national security. * Warm greetings to all of you, I am a descendent of the iwi of Ngati Porou Nga Puhi and Te Rarawa, therefore greetings to you all. Kia ora koutou, aren’t you magnificent [to audience] [claps]. Tonight I want to focus – I’m going to be bit of a lawyer, it’s my day job – I want to focus on one aspect of the Bill in particular, Section [C], Section 8c, which involves the GCSB giving assistance to the Police, the Defence Force and the SIS. Section 8c can bite whoever it likes and allows the GCSB to access our mobile networks and to collect all our phone calls, texts and data. Now we’re supposed to not worry about that because the Police or the SIS need warrants to do that. 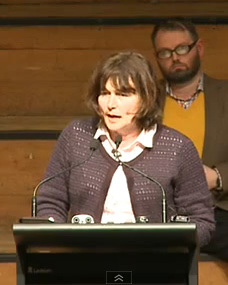 Now those of us who know anything about the Urewera Raids and the cases that followed [audience claps]. Shows how easily interception warrants are granted by judges – and that even when they are granted the Police exceed the terms of those warrants because it’s common practice to do so. Indeed – and I can say this because I have seen the evidence, none of you know this sweep was in that case; and you would be horrified to know how many people were caught in that web. If we move onto the SIS the warrants are even worse. Under the SIS Act its functions are to obtain, correlate and evaluate intelligence relevant to security, and to communicate that intelligence to such persons and in such manner as the Director believes to be in the interests of security. So what is this beast called security? So the basis of an SIS warrant is that you or I are engaged in activities that are deemed by those who issue these warrants to be contrary to the international well-being or economic well-being of New Zealand – now if that is not an empty box into which Prime Minister Mr Key and his cronies can put in anything they want – I don’t know what is. Now let me link this to the particular campaign that I’ve being working on at present to stop the conclusion of a mega-deal called the Trans Pacific Partnership Agreement [audience claps]. Which is driven by and for the US and its corporations. 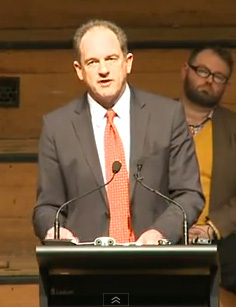 I want to highlight two connections – the first is the Government believes the TPPA is in New Zealand’s national interests and so I have no doubt Mr Grosner and Mr Key and others believe that our attempts to stop it are impacting adversely on New Zealand’s economic well-being – we are therefore open slather for an SIS warrant. Now many of you will also know that they insist on keeping their side of these negotiations secret at the same time as they desperately want to know what we’re doing to try to stop them. But it is not only the SIS that can get a warrant, under the GCSB Bill, the GCSB will be spying on all our international colleagues who are working on this international campaign. You will know we had leaked chapters – leaked chapters come from somewhere inside and somewhere around the world – and they want to know where those came from, who they came from, how we analysed it. They will want to know will there be any more, they will want to know if we are talking to negotiators of other countries that might be pursuing interests different from New Zealand’s – aka Fonterra [audience claps]. They will want to know whether we are advising any other negotiators in other countries, or indeed any other lobbies, about what New Zealand’s positions likely to be so they are forearmed in trying to bat back some of the more offensive demands from our end. This is major problem not just for us but for those who work in other countries for whom doing this work is high risk. There are security laws, including in the US that can get some of those working on these issues into serious trouble. But the second aspect of this agreement is that it will extend the laws that are available, to be able to spy through the networks. Now in the beginning of these negotiations, we tended to view the likes of Google and Yahoo and Facebook as our friends as opposed to Hollywood and Microsoft and co. who were the bad guys – we’ll their still the bad guys – but since it was revealed the others have now being working to assist the national security agency to digitally eavesdrop through the PRISM project, they are not our friends either. So we’ve being looking more closely at what they have being doing. But having established that network, what they do is make themselves a convenient one-stop shopping space for the NSA and other security agencies, including the GCSB. And so what they are seeking in the Trans Pacific Partnership Agreement is an extension of the rules that are available to them, where if we tried to put impediments in their way, not only can the US sue our Governments but those mega-companies can sue our Government s and seek massive damages because we have had the effrontery to try to protect our rights to determined our future. Kia ora koutou, it is fantastic to see you all here tonight. This law represents an unwarranted attack by the state on its own citizens, no more, or no less [audience claps]. It disregards all of our rights to operate freely within the law from unreasonable search and to correspond with each other without interference. It miss understands our need for basic right of privacy – and it is no coincidence that as electronic developments allow more freedom for people to communicate by passing the normal mass means such as the media, mammoth efforts are being made to stop that from happening. And the concept that those with nothing to hide, is being used in a dishonest and accusatory way, to stop people like you and me from objecting. Well we in the trade union movement have stuff to hide. We have plans, strategies, disagreements, debates, bargaining positions, workers’ secrets and personal stuff to hide, and this makes us an important part of a robust democracy [audience claps]. And the states job is not to attack us in doing that work but to protect us, and allow us to do it [audience claps]. The state’s job is to allow us to thrive and to provide otherwise disenfranchised working people with a voice without interference – that is the state’s role. To allow us to do our job including helping us to hide stuff in the growing age of electronic communications [audience claps]. Many social activists challenge the dominant economic narrative, the one that for example accepts massive inequality as a reasonable proposition. Have, been being spied on, we’re no doubt being spied on already, but this Bill explicitly provides for it, provided the Prime Minister considers our work against the economic interests. It expanding the right to spy on this basis is completely inexcusable. And workers are already, under this Government, finding themselves the victim of the nothing to hide mantra, to subjugate them at work. Their privacy is being increasingly invaded by spy cameras watching their every move, such as those installed by the Port of Auckland into every crane and carrying machine on the wharf to humiliate those wharfies after their return to work when the Port failed to outsource them to cheaper labour. Workers are increasingly being drug tested without cause, and the Government is actually encouraging employers to drug test beneficiaries that they are considering employing. Searchers of bags, scanning finger prints to checkin and checkout of work, requiring sick notes after one day’s, a single day off work – and recently a case of an Air New Zealand flight attendant having her bank records ordered up by the court to find out what she was doing on a sick day. Already the disregard for workers’ privacy is massive and this law is another attack on that. And something needs to be done, in terms of the human condition, the desire to retain our privacy and to have some boundaries [are]. Already the autonomy of workers is being [degradated] and it’s designed to humiliate workers and remind them where they are in the chain of importance. And now this – an attack on all of us – an attack of all of our privacy, from a Government that wants us to live in fear of each other rather than in hope of things better [audience claps]. And finally I want to address the hypocrisy of this and the way the Government, the way the Government is behaving. Firstly we heard the Prime Minister say the other day that we should trust him not to misuse this law – well why should we? Not only is this an unreasonable request but the record shows his and his Government’s disregard for peoples’ rights over all. The heavy handed investigations into the Dunne-Vance leak, the leaking of beneficiary records when they complained about Winz, the return to Board of Trustees of letters teachers wrote to the Ministry of Education in their private capacity – nothing that they do indicates that we can trust them. The secret deals with multi-national companies to remove basic human rights, such as freedom of association, and the continuing implementing of laws that reduce appeal rights of citizen – and the unexplained vigour of the prosecution of Kim Dot Com, which remains unexplained despite its high profile. But also the hypocrisy of politicians like Peter Dunne. He is implicit [audience claps]. He is implicit in laws that remove human rights, left right and centre, and then he asserts that he has a right to privacy and somehow his emails should be sacrosanct [audience claps]. On this record, to ask us, to trust this law, and to trust this Government, is the height of arrogance. Like you, we are furious about this law change, as much for what it represents as for what it will do. It is part of a slow pattern of legislations the breaches the most basic of human rights, and makes our society less fair, less democratic, less equal, and it should be resisted. Well I’m not a politician so I will leave the politics to the politicians; and I will not try and give you a legal analysis of the GCSB Bill there are other people like Rodney (Harrison QC) who are far better placed to do that than me. What I would like to tell you about is my own experiences as a working journalist because I think it offers some insights into why caution might be in order when it comes to introducing new spying legislation. I’ve been reporting on issues and events associated with this so-called ‘War on Terrorism’ since the attacks of 11th September 2001. Part of that reporting has seen me, like my colleague Nicky (Hager), looking into what New Zealand’s role really has been in the ‘War on Terrorism’. And what I started to notice after a few years was that some people in the Government and the Defence Force weren’t all that happy with my work. First there were murmurs, discontent, rumbles, then it extended to rumours, bad-mouthing, and occasionally to complaints – none of them sustained. On one occasion two years ago, direct threats were made to my safety and that of my sources by a senior serving Defence Force Officer; not pleasant but not entirely surprising – journalism after all is not a popularity contest. However it went further than that, that same Officer who threatened me openly boasted to me that he had information about my movements. He knew when I was coming and going from New Zealand, he knew he said when I was in Afghanistan. And evidence in a recent defamation action I was involved with last month confirmed that the Defence Force did indeed know when I was arriving in Afghanistan and it confirmed that they’d been monitoring my movements there rather closely. How did they do that? We don’t yet know all the facts but what we do know thanks to recent story in the Sunday Star Times was that the Defence Force asked its allies in Afghanistan to provide them with copies of my telephone ‘metadata’ – presumably so that they could get a clearer picture of what or where I was and who I was speaking to. We also learnt that for the past decade or so senior Officers in the Defence Force have categorised, quote, certain investigative journalists, unquote – as ‘subversive threats’ to our nation – I think it’s fair to say two of those quote investigative journalists are here tonight. So what sorts of information have we been revealing? There was information that contradicted some of the things that our Government and Defence Force have told you. Information they didn’t want you to know. Information like how our Special Forces had detained dozens of people in Afghanistan and without recording their names or other details transferred them to US Forces who abused, mistreated and tortured them. And in Nicky’s cased it was revealing in the way in which our military and intelligence staff had been assisting the Americans in the ‘War on Terrorism’. Doing things like, helping plan drones strikes in Pakistan. This information was politically [in]convenient, it was embarrassing, but it was not information that put lives at risk or which undermined our ‘national security’ in any meaningful sense of the word. For me it’s disturbing to think that all a journalists’ needs to do to be lumped in with terrorists and foreign intelligence organisations is try to do what any journalist worthy of the name is suppose to do – hold the powers to be to account [audience claps]. And it made me wonder, what might this document, that revealed journalists, quote, as subversive, unquote, what might this document tell us about the mindset of our security and intelligence officials, if this is the sort of mindset prevailing in the upper echelons of our Defence Force. Did they also see journalists as ‘subversive’? Might the new powers being sort by the GCSB potentially be used to monitor journalists? Or to try to locate our sources for stories that have embarrassed or inconvenienced those in power? Now a decade ago I would have said there were no chance of that – these days’ I’m not so sure. On some of the interpretations of the GCS[Bill], and again I am not an expert, but it seems clear that an unnecessarily wide range of information can be gathered from a wide range of people, for a wide range of reasons, and stored, analysed and shared with agencies here and abroad. “Were not the ones spying on journalists, were the ones defending them [audience laughs]. Well excuse my cynicism, I don’t believe him, and I know another journalist in Wellington who doesn’t either. On the basis of my experience with a number of senior Government officials and Military officials, on the basis of this Government’s attempt to pass this piece of legislation without sufficient discussion, public debate, and on the basis of their frequent attempts to denigrate or marginalise dissenters in this country – like Mike Joy, or Nicky Hager, or the Human Rights Commission – I find it hard to trust them. My view for what it’s worth, we need a thorough, transparent and impartial review of the work of our security and intelligence agencies and of our Defence Force before any new legislation is passed [audience claps]. Before we trust our security and intelligence officials with greater powers to monitor our electronic communications, in a day and age, when most of our lives are stored online, let them demonstrate that they are worthy of that trust. Let them explain to us what they did and are continuing to do in the so called ‘War on Terrorism’, and how they used the powers they were given after the ‘War on Terrorism’ began and ‘Weapons of Mass Destruction [audience claps] – we’ve heard that line before. Let’s ensure the laws in which our security and intelligence agencies operate are drafted as carefully, clearly and transparently as possible. Let’s ensure there is rigorous and effective oversight of these agencies and not just someone rubber stamping their actions. There are good men and women in our Defence Force – there’s no question about that – and one would like to say the same for our intelligence agencies, but let us ensure their skills and commitment are not misused. Let us ensure that any powers given to these agencies are in the interests of the New Zealand public and not just the interest of the powers that be in Wellington or in Washington. [Intro no video] – speakers who follow to shine with their brilliance and passion, but I get to do the tough boring stuff. Now those claims are wrong and misleading – and I want to take you through the wholesale spying powers in the short time I have available. In a nutshell Mr Key is wrong in law in claiming that New Zealanders have nothing to fear. He is wrong in his limited analysis and he overlooks the fact that the statutory intelligence gathering powers of the GCSB are being expanded at the same time as the functions are. Now there are three features, and I’m sorry if this is a bit dense, but I’ll do my best. There are three features that come together to bear out my claim there is a major increase in spying powers here. One is the definition of infrastructure, the next is the increase in functions of the GCSB, and the third is the increased powers of collection of information, information gathering and interception. Now the present Act limits the GCSB to gathering and analysis of foreign intelligence – that’s defined the way you would expect to be defined – to be about the capabilities and activities of foreign organisations and foreign people. So the present Act contains a prohibition on spying to obtain intelligence from New Zealanders – now the Bill abolishes the restraint on GCSB activities to foreign intelligence – and it confers three considerably expanded functions. As to Mr Key’s denial, that that’s an expansion of power, I say this, if you start off with one limited function in the present Act, you abolish the limits and then replace it with three new functions, isn’t that an increase? I thought John Key was suppose to be good at numbers [audience laughs]. So just quickly, dealing with those three major features – first the crucial new definition of ‘infrastructure’ – this is a technical definition but it is wide enough to cover all kinds of electronic data systems starting with your phone, your computer, your internet service provider, and any telecommunications network – so not only is an ‘information infrastructure’ any one of those – it is also defined to include the ‘content’ on each of those, now that’s key. So it’s not just going into the mechanics of it, the content is included in this definition of infrastructure, which plugs into the powers. So then you’ve got the three new functions – am only going to deal with the first two of these – first there is 8a would give the GCSB a much wider cyber security protection function, but they have intelligence gathering powers under things protection. And on television John Key compared this function to having a superior version of Norton Anti-Virus [audience laughs]. Yeah right! How do I get to uninstall the GCSB from my computer [audience laughs] [claps]. On television last week, Mr Key also claimed that under this 8a cyber security functions, content could not be accessed. When the ‘Herald’ pointed out his error, he panicked and he issued a later written statement saying “we’ll anyway; I’m not going to approve cyber security warrants under this first function” [which would seek New Zealanders consent] he said “in the first instance”. Now just stop and ponder for a moment the implications of how unprincipled that is. He’s being, he’s pushing this legislation through; it’s been pointed out to him that this 8a cyber security function does not give New Zealanders any protection and what does he say? [I’ll leave ‘content’ out] – Despite the fact the law will say the GCSB is entitled to such a warrant? He’s just going to amend the law – behind closed doors or we’ve got to believe that he will? Under 8b there is a new intelligence gathering and analysis function which is to be conferred. This is worded very broadly because it plugs into the definition of ‘infrastructure’. What I want you to understand about these functions is that they’re not restricted to targeted intelligence gathering, that is to say – wholesale spying on New Zealanders or anyone else. There are two new powers; one is called an ‘interception warrant’ which existed but is now widened and there is a new ‘access authorisation’. Now this can be granted to the GCSB authorising the accessing of one or more specified information infrastructures or classes of infrastructure. So they can just specify for example, they will intercept all communications, content included, coming from a particular overseas country or on a particular server. What’s more, when and if, the Bill becomes law the GCSB does not have to make out any particular threat to national security to get a warrant. By contrast with the SIS which has to make out a security threat – the GCSB will not have to do that. Now I just want to close then by saying this – the Prime Minister’s belated attempt to reassure New Zealanders they we’re not sleepwalking into a total surveillance society is flawed and it ultimately fails to convince. John Key might care what kind of economy he wants to leave behind when he departs office but the sad fact is he does not care about the kind of society the rest of us will be landed with [audience claps]. And lastly Mister Time Keeper, the Bill currently stands to voted into law by a majority of one – now that could be any Government MP at all – but it turns out to be, likely to be, the vote of Mister Peter ‘Willing Buyer/Willing Sellout’ Dunne [audience heckles][claps]. Now this is a travesty – the entire process stinks to high heaven. Is it really too much to hope for that there is one independently minded MP of the present Parliamentary majority who has the clarity to say no. It’s great to be here with you all tonight and I think it’s a great thing that we are meeting in the Mt Albert War Memorial Hall because it is one of those places that was built in memory of those who went off to fight for democratic freedom. When I think of the price that they paid, I remember my Dad and his two brothers who in 1939 went off to enlist in the Navy and the Air force. Dad couldn’t fight. When he went to join the Air force his medical showed scarring on the lungs and was sent off to Christchurch to a sanatorium. My Uncle Bert joined the Navy, became a Commander of —- (inaudible) —- in the Pacific. My Uncle George, he was my Godfather, joined the Air Force, flew Mosquitos, became a Flight Lieutenant and was awarded the VSC. They were upright, honourable men, with a strong sense of duty and service. They and their friends took it for granted that they should risk their lives for future generations. So when trying to understand what drove them I’ve looked at reports of local newspapers at the time at the outbreak of WW2, and the Evening Post for example drew a very sharp contrast between repression under fascism in Europe and freedom of the press in New Zealand. These were the values – human dignity, freedom of thought and expression, and a happy, comfortable life for ordinary people. But my father‘s generation was prepared to die for it. And they didn’t do it in vain. Along the highways and byways of New Zealand there’ll be people just like them – upright, honourable, gifted and generous – and I’m not surprised either that these days so many young New Zealanders attend ANZAC Day services in numbers every year. So many fantastic young people in this country whose values I really respect and admire. Like me, they want a country they can believe in. So out of this, what has happened in the corridors of power in New Zealand? Somehow the values there often seem very different. Over the past 30 years perhaps some strange and curious doctrines, powerful, superficially persuasive though, have been wafting out of the Beehive. They include for example the myth of the free market. At the time, the time when democracy was invented during the Enlightenment, Adam Smith and other Enlightenment figures argued for a market free of the rule of the ‘merchants’ as they called them, or ‘corporates’ as we would say today. In the name of the free market however, in this country since the 1980s, I think we’ve been served up the opposite – the canius wolf dressed it up as free market lamb. And there’s that myth too of the isolated cost benefit calculating individual. That’s another illusion. Whilst no one is like that, if they did we’d regard them as a sociopath. So there has been this all out assault on the idea of community, the commons, and the ‘public good’ and this is what I think is the true tragedy of the commons so to speak, a concerted attempt really to destroy the idea of society itself. To demolish the notion that social relationships amongst us all really matter and to undermine values like justice, truth, generosity and honour that guide us in conducting our collective affairs. And this assault is not just cynical and amoral, but its non adaptive because our species is above all, Homo sapiens, we’re a social animal. Through language we work together on common tasks and pass these skills on to others. As human beings we rely on each other for our security and our prosperity. Participatory democracy, what we are talking about here tonight, builds on those strengths. When people from all backgrounds, we’ve got in the hall tonight, take part in decision making, we can spark off each other, create new ideas and enterprises, and social relationships flourish along with the economy. Autocratic, extractive, highly unequal regimes on the other hand don’t pass the test of longevity. Such nations falter, both economically and socially, and eventually fail. So I’m saying that this is why the idea of society that values like truth and honour and justice and generosity really matter. Our forebears understood this, and if we want a free, prosperous and exciting society to live in we have to be prepared to stand up for it if it is threatened. Surprisingly it seems that time is now. Over the past few months a series of laws, over the past months a series of laws, have been passed that threaten the rights of New Zealanders – this is a matter of such gravity that last month the Law Society felt compelled to report to the United Nations that in New Zealand, and I quote, “a number of recent legislative matters are fundamentally in conflict with the rule of law” [audience claps]. Extraordinary though that might seem this statement is no more the truth. In his report, the Law Society lists ACTs that allow the Executive to use legislation and regulation to override Parliament – it denies citizens the right to legal representation which cancelled their rights to appeal to the Courts to uphold their rights under the law. They also drew attention to the use of ‘Supplementary Order Papers’ (SOP) and ‘Urgency’ to avoid proper Parliamentary scrutiny of the laws that had passed [audience claps]. In many ways this is frightening. They expressed their concern that – a number of Bills formerly declared by the Attorney General to be in breach of the Bill of Rights – had recently been enacted. When a body as authorative and dispassionate as the Law Society feels forced to report to the United Nations that the Government of New Zealand is acting in conflict with the rule of law I think all of us need to be very concerned [audience claps]. I think all of these defects come to a head in the GCSB Bill. This agency which is set up to deal with external intelligence threats is surrounded by scandal. The process that leads to appointment of its current director has come into severe question. It’s been accused of carrying out illegal surveillance of New Zealand citizens. Instead of putting matters right, this Bill allows the GCSB to legally spy on New Zealanders – almost without limit – a kind of electronic McCarthyism – [and] the only effective controls really are in the hands of politicians. This is in breach of the Bill of Rights – it’s been reported to the United Nations and despite this it’s been dealt with under ‘Urgency – and when the Human Rights Commission raised concerns about its provisions the Prime Minister threatened their funding. I think all of the authorities that looked at this legislation carefully have argued that the GCSB Bill ought to be shelved until a robust and independent inquiry into New Zealand’s intelligence agencies to be carried out [audience claps]. We all need a chance to participate in a robust and searching debate about the powers that they might – duly? (12.13) be granted. And as New Zealanders, you see in submissions, editorials, opinion pieces across the country, this Bill has been almost universally condemned. 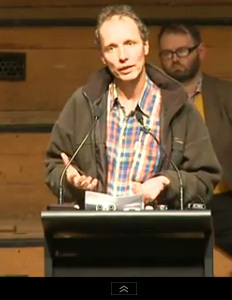 If we had a healthy democracy in New Zealand the Bill would of been shelved by now [audience claps]. It will be I think, an absolute indictment on this Parliament if it is passed. So I think as Kiwis we need to remind politicians from each political party – this is not a partisan political matter. From National, from Labour, the Maori Party, New Zealand First, Mana, ACT and United Future that democracy is not a partisan political matter: as MPs they are accountable above all to their constituents – not to their whips and their leaders. It’s their job to stand up for the rights of New Zealanders when those are threatened and its times like this they need to show some backbone and prove that they are worthy of the trust that we place in them. As for the Prime Minister and the Executive, I think we need to remind them we send them to Parliament to represent us not to rule us [audience claps]. As John Key then the leader of the Opposition declared in a rousing speech against the Electoral Finance Bill in 2007, and I quote, “this is a dangerous Bill, it’s dangerous for all of us as individuals, it’s dangerous for our democracy and it is dangerous for New Zealand, we should rightly be proud of our democracy,” he said, “it is the very real New Zealand achievement and we should celebrate it. A lot of the countries never made it. Plenty have tried democracy and let it slip through their fingers. A quiet, obedient and docile population” and I’m still quoting here, “a culture of viscidity and apathy, a meek acceptance of what politicians say and do, these things are not consistent with a democracy” [audience claps] and I’m still quoting, “a healthy democracy requires the active participation of citizens in public life and public debate (well here it is) [audience claps] and without this participation democracy starts to wither and becomes the preserve of a small, select, political elite.” [un]quote – all I can say is ‘Amen’. If unlike our forbearers’ before us, and we’re not going to get shot at and killed, if we don’t stand up to defend the democratic rights and freedoms that they fought for, for our children and grandchildren, we should be ashamed [audience claps]. So in closing I’d like to wish us all so well as citizens of our country, hope for us all a bright future and I’ll end with a whakatauki “kia hora te marino, kia whakapapa pounamu te moana, kia tere te karohirohi” – “may the calm be widespread, may the sea glisten like the greenstone, and may the shimmer of summer ever dance across your pathway”. Ladies and gentlemen, do you know what the most successful television commercial of all time (interjection), ah no. I’ll paint a picture. This commercial was so powerful that it was only ever shown on television just this one time, in the United States Super Bowl. A single time, and yet decades later people remember it. Now Steve Jobs and Steven Wozniak had a dream that computers were going to free us, y/know oppression, they were going to free us to, the common man. Instead of computers been hard to use, instead of not having a graphical user interface, they were going to enable it for anyone – journalists to write stories, produce documents, and a whole range of things, and they had, and that dream has come true. So if you haven’t read ‘1984’ you should – I think the people in the National Party have read George Orwell’s ‘1984’ of a dystopian, dysfunctional society overseeing it’s citizen’s but I think that they mistook it for a guidebook to be honest [audience laughs]. So we’re lucky that in 1984 George Orwell’s vision, so prescient didn’t come to pass and that Steve Jobs and Steve Wozniak’s vision did come to pass and that computers have freed us and have done so many things for us – but things are changing – and for the worse and what we must hope is that 2014 doesn’t come 1984 just 30 years too late. So what were we doing in 1984? We were electing David Lange as our Prime Minister at the very same time [audience claps] and we were protesting against nuclear weapons in this country; and when I started researching the firsts that New Zealand has done I choked up, and I choke up now, because we are a country of innovators – we were first to ban nuclear weapons, we were first to give women the vote [audience claps]. We lead the world and there’s actually a biological and scientific reason why. You see there’s a biological phenomenon called – forgot the name, it’s embarrassing – ‘punctuated equilibrium’ – thank you brain – and ‘punctuated equilibrium’ basically says that, the, on the edge of a species the citizens are most likely to evolve faster . So for example if you have a colony of penguins, then the penguins on the outside are the most likely to explore, most likely to try something different, most likely to do something different from the rest of the colony. And so New Zealand is on the edge of the world, we’re further away from anyone else and that’s why we are leaders. That is why Sir Edmund Hilary wanted to climb Mt Everest, that’s why when WW1 started we put up our hand and said “yes, we will go first”, we were first and only country in the Commonwealth, we were the first to provide universal healthcare, the first to provide state housing, the list goes on and on and on, I found pages and pages of things New Zealand has done first in, and it is important we don’t forget how we have fought to be an innovator. It’s so easy in New Zealand to get caught up and think that we’re a silly little country in the middle of nowhere. But I travel a lot and I can tell you that New Zealand has a place in the world as the first – New Zealand has an important role to play. Do you know something else we are first in? At the moment we are number one for freedom in the world, number one [audience claps]. We will lose that tomorrow, we will lose that, guarantee you, because, and the thing that is terrifying, if you can think that New Zealand is the freest country in the world what is it like for the other 200 plus countries? You know the freest country in the world is going to bring in this, this legislation which is going to spy on the population, what of the other 200 countries? Well only 40% of the world’s countries even have the ability to vote or any kind of democracy – 60% of the countries don’t have that option at all. So New Zealand, we must lead the world into light, we must show the way. In 1984 we did that and we must do it again – it’s so important. An error only becomes a mistake if you fail to correct it – and if John Key or any of these politicians fail to correct their error tomorrow then we must do it for them in 2014. We must [audience claps] and we will, we absolutely will. The New Zealand taxpayer, you the New Zealand taxpayer has spent $1.5 billion dollars to roll out the Government’s ultra-fast broadband network – what’s going to happen is your internet connections are going to turn to the same as Kim Dot Com’s connection, they’re going to slow down so you can’t play games because all of your information is been spied up – not joking. As soon as the Telecommunications Intercepts Bill comes into law after the GCSB, I may not be allowed to talk to you; as the owner of a telecommunications company I will be gagged. Under the Telecommunications Intercepts Bill men in black will come and install black boxes in my service provider, they will be able to tell me how my network is run. The internet was born on the basis of a free and open network – no one owns it – but this is changing. The US and New Zealand Governments are trying to take over ownership and put the ownership of the internet in government control. But the great thing about the internet is the protocols allow you to route around failure – the internet was designed to survive a nuclear attack. And Ernest Rutherford, another Kiwi, another first, he discovered the basis of the Atom – we are leaders – we must, we must prevent this, and if we can’t, then we must vote for people who will. Thank you very much. Can you hear me well? So you are all part of a giant Hollywood experiment [audience laughs]. It’s the first real time spy thriller in history. It will play out over a period of approximately seven years – it started as a bit of an action movie, turned into bit of a drama, and it will end as comedy [audience laughs]. It’s a Hollywood production directed by the White House and John Key. And we have a magnificent cast [acknowledges other speakers] [audience claps]. Let me share a little story with you about how I found out that I was spied on which lead to everything that followed, including us been here. I’m an avid gamer Modern Warfare on Xbox and there’s the other one [speaker laughs/audience laughs] and I noticed that my speed, my internet speed went down to about 20 – 30 milliseconds (speaker laughs/audience laughs). A normal internet user would never ever identify that but me been a gamer, and a competitive gamer, I noticed it and I was wondering to myself y/know why it is I hired a guy to check my systems and y/know contact Telecom and all that and only after the raid did I figure out what happened – they rerouted all my traffic. They rerouted it in a way that they could capture all my data that went through my connection and it ended up in a system that is now known to all of us because of Edward Snowden – it’s called Prism – and the system that allows the GCSB to access Prism is called X-Keyscore. We know, from the leaks that Snowden released, that X-Keyscore is been used by New Zealand, by every Five Eyes spy network partner. And when John Campbell asked John Key that, you can be sure John Key would have said “no” in a heartbeat if the GCSB didn’t use it; instead he said he cannot talk about it [audience murmur]. And X-Keyscore is basically a “Google for Spies”. All your data, all your communication, when you use Facebook, when you use Skype, when you use Apple, or iCloud, or Gmail – all of that goes to a tiny cable that is as thick as your thumb, from here to the United States and everything is stored there. So what the GCSB agent does when he wants to find out about you and you become a ‘person of interest’, all he has to do is type in your email address and all your emails from the last five years will pop up and be available for analysis and review – and this is the reality – so when the Prime Minister tells all of us that there is no mass surveillance and that’s not what the GCSB is about he is lying straight to your face. It’s dishonest and its wrong and you need to understand this. He hides behind a term where he says “his lawyers tell him it’s legal,” because it’s “not the GCSB doing it, it’s the Americans doing it,” [audience murmur] but the Five Eyes turns all of them into one. It turns the GCSB and UK, and Australia, the US and New Zealand into one entity that spies collectively on the world’s population and the GCSB is part of it – and the GCSB has access to data of every New Zealander and there’s absolutely no doubt about that. So if we allow this law to pass we are basically allowing John Key and his Government to legalise this action that is clearly against the law. He says it’s not because the American – huge difference if you are part in a spy network that does that; and then John Key says “well we didn’t ask the Americans to do that, we didn’t want them to spy on New Zealanders – if they do it y/know – it’s not our problem,” but the problem, you have access to that information, so you are spying on all New Zealanders and if they pass this Bill they will do it legally, which is what I think – the birth of a surveillance state in New Zealand. Every wireless call in New Zealand is already being captured and the bulk data been transmitted over to the US. We know that because one of the Snowden leaks have shown that Telstra in Australia is providing bulk caller data to the US as part of being in the Five Eyes network and as part of [that] the condition is to have the submarine cable connected to the US. The US said “hey if you want to land here, these are our conditions, you need to provide us with all the data”. You need to know the GCSB and the Police, when they talked about my case they used encrypted telephones – they didn’t use normal mobile phones (we know that because of discovery in our court case) and if they feel that on their own domestic network they need to switch to encrypted telephones, it tells you quite a lot – they know that every call is already being monitored. Now when John Key went to Campbell Live he said something that I found quite incredible, and I quote “if GCSB decided to listen to all calls and read all text messages of every New Zealander it would take 130,000 staff and would cost $6.6 billion dollars” – now what a load of nonsense that is. The reality is, they capture all calls, they turn the calls into text, with advanced software that can recognise what you say, they then have an algorithm with ‘key words’ that runs over all the text to identify the things that they are looking for and then that text is stored indefinitely and searchable forever. So this explanation from John Key is really trying to misinform you, us, the misinformed New Zealanders who don’t have a clue about why we are opposing the GCSB Bill and y/know why we are all so wrong. We are being lied to. We are being fooled into thinking that this GCSB system, this new Bill is created to protect us, but what it actually does, it empowers the Government to an extent that was unknown before the Snowden leaks. At this point and the world is waking up to this wrong – this breach of our basic human rights – we have a Prime Minister of New Zealand who thinks he can just push this through with one vote, with so many people against it, the vast majority of New Zealanders against it. And see this is something you have to remember because in November 2014, if this Bill passes, you have the chance to say ‘no’ to this Government and to change [audience claps] and to change what they are going to put into place tomorrow [because I think it will pass] – unless there is a brave National MP whose not following John Key blindly into disaster – because there are more Snowden leaks to come out. There is my case against the GCSB in court, which is going to function as an independent inquiry and a lot of things will come out about more illegal spying, about the cover up, and when all of that happens National MPs need to be sure that the people of New Zealand will remember what John Key has done and they will judge him for that and they will cast their vote accordingly in November 2014. Is the pot plant recording?